It’s that time of year again when we swap our flip flops for boots and dust off our box of Christmas decorations. On a winter day there’s always lots of fun, unexpected and affordable things to see and do in London! Plus, if you travel around London at weekends, on bank holidays, between 9:30 and 15:59, and after 19:00 on weekdays, you’ll get the best value for your fare when off-peak fares apply. Up your social media game and visit the most Instaworthy light displays in the city. You might decide to do a spot of last minute Christmas shopping while you’re there? And if you’re travelling into Zone 1 during evening weekday peak, you’ll only get charged an off-peak fare. Central London is also packed full of amazing free to attend markets. Head to Christmas Borough Market, Southbank Centre winter market or Winter Wonderland in Hyde Park – prepare to be dazzled! If you don’t have time to pop over to Germany for their famous Christmas markets, head to these spectacular free to attend markets closer to home for all your bauble and trinket needs. For fresh air and – weather depending – snow angels, visit some of London’s most picturesque parks. And the best thing of all, they’re free! Did you know up to four children under 11 can travel for free if accompanied by a fare paying adult? Make the most of great family friendly events across London this winter. Even better, with a Zip Oyster photocard kids aged 11-15 travel free on all London buses and trams, and at a discounted rate on most other TfL services. Explore more than 500 museums, galleries, street art and more, all within a short walk or bus ride from each Underground station with our interactive Cultural TfL Map. Plus, with our Hopper fare, you can take unlimited bus and tram journeys anytime, anywhere for £1.50 within one hour of touching in! 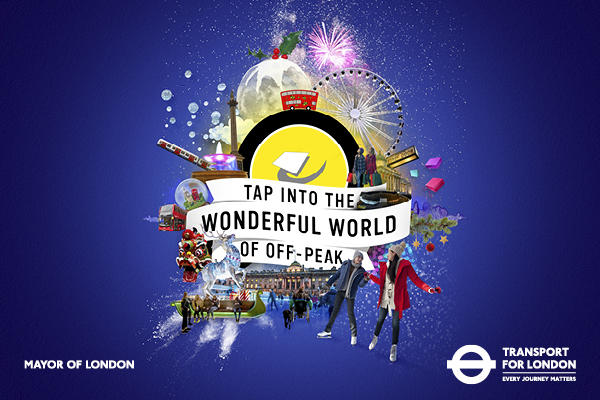 Go and discover London off-peak this winter at Time Out. Remember: if you’re drinking, drink responsibly, and take care of yourself and others when travelling home. Christmas time in London is always magical. Thanks for the info on the markets. I will get to at least one this year.